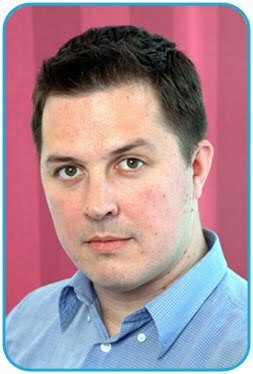 As part of their 10th birthday celebrations Google have re-instated their oldest web index from January 2001. This index is accessible through http://www.google.com/search2001.html, uses the original Google Homepage logo and allows users to search using the January 2001 Google web index. Using the January 2001 Google index makes me realise how far both Google and the web have come in just 7 years. Results from 2001 are just text and the results themselves look very different. Top ranking sites are a mix of random addresses and pages hosted on services like Geocities. 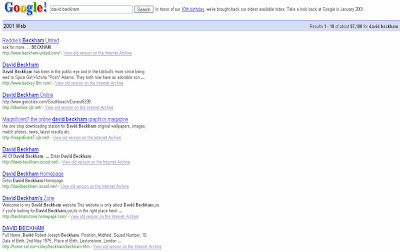 No mention of Wikipedia or any major news organisations in the top 2001 results for the queries I looked at. 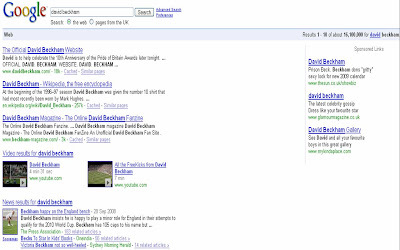 'David Beckham' on Google 2008 produces 16.1m results with official website http://www.davidbeckham.com as top result. In 2008 'Britney Spears' produces 86,700,000 results! 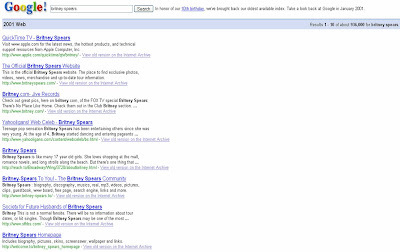 Wikipedia is at number one, but the official Britney Spears site remaining in second position. 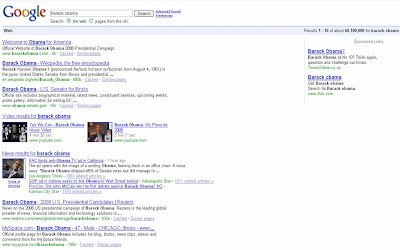 In 2008 Google returns 60,100,100 results for 'Barack Obama' with the top result being the official Barack Obama site and number two position being the Barack Obama entry from Wikipedia. Being able to play with the January 2001 Google Index really does bring home how much the internet has developed in the last 7 years. 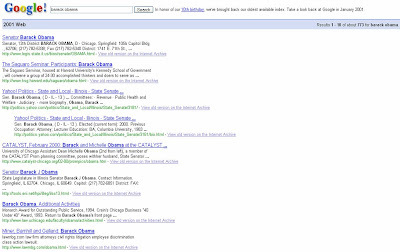 It also shows what an incredible rise to prominence Barack Obama has had - the increase in Search results for 'Barack Obama' over this period amounts to an average of around 20,000 new results each day, every day for 7 years! I had to tear myself away from searching the old Google index this morning. It's good to see I wasn't the only one dipping in and enjoying the strange results! What I found interesting is the fact that a search of "Google Maps" (obviously from before it was created!) brings up 3 results compare to 68,300,000 today! An even bigger rise compared to Obama.